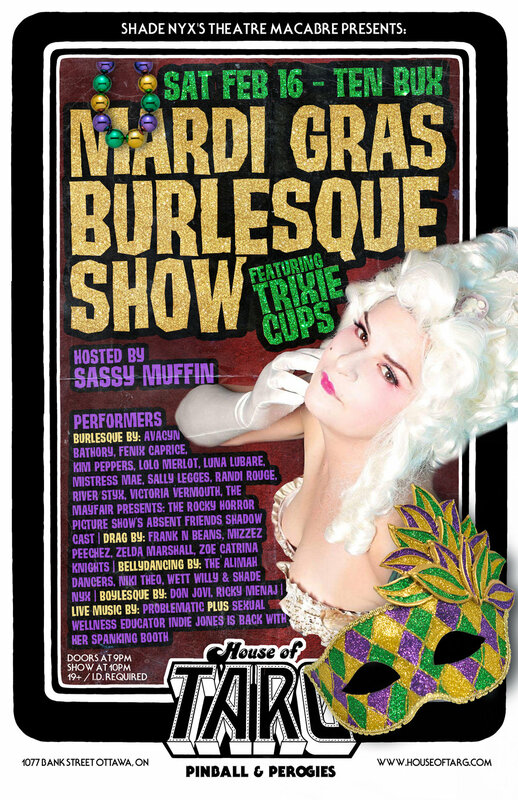 Shade Nyx and her Theatre Macabre are back for another Mardi Gras Burleque Blow out! In this edition we welcome our feature performer: Trixie Cups ! Trixie Cups is a burlesque peeler who has performed across many stages in North-America. She was part of Montreal’s famous Blue Light Burlesque troupe, regularly performs with the irrepressible CandyAss Cabaret and has graced the burlesque stages in Ottawa and at Burning Man. An incorrigible artsy weirdo with a playful sensuality. A temptress in a teacup! Sexual Wellness Educator Indie Jones will be back with her spanking booth and a mini demo! $5 for 5min of spanking or massage!